If software can be injected into an industry’s product it will bend to the will of the software writers. This theory expands on Marc Andreessen’s observation that “software is eating the world”. The evidence is that software, coupled with microprocessors, sensors, batteries and networking becomes applicable to an increasingly larger set of problems to be solved1. Software has “eaten” large portions of entertainment (e.g. Pixar, iTunes, video games), telecommunications (iPhone, Android, Messaging), various professions including journalism, management and law, and is entering transportation, energy and health care and poised over banking, finance and government. As entry happens, asymmetries are enabled and disruption follows. This is the bending to the will of the writers–who tend not to be incumbents. The incumbents can’t embrace the changes in business models enabled by software without destroying their core businesses and thus, invariably, they disappear. The pattern is easily observed but the speed and timing of it is difficult to predict and hence investment success is not certain.2 There are many entrants who try and few succeed and there are many incumbents who will survive longer than a prophet can stay hungry. Nevertheless, this process of software-induced turnover in wealth–and, incidentally, vast, additional wealth creation–is inevitable. But can we predict anything other than timing? For example, can we predict the next industry to succumb to this force? There is hope because the last big disruption was predictable. When looking at what caused telecom to become a domino, the pattern of development of hardware pointed the way. It was clear in the late 1990s that computers would become small enough to fit in one hand. The first instances were PDAs (mid-1990s) and once they proved valuable in solving many jobs it was easy to plot their evolution into phones. So if we follow the “packaging” constraint, it’s clear that computers are becoming small enough to be worn. Many prototypes exist and even small companies can build them. All that is needed is a new user interface and a new platform will be born. Once a platform is born, the creativity of millions can be unleashed to expand the problem set that can be solved. The process then repeats. So it’s obvious that as a computer becomes wearable it will affect the industry that currently is hired to also be worn: apparel. Apparel is the word describing every garment, shoe and accessory product sold and amounts to about $1.2 trillion/yr.34 This amount of money is not spent only to protect the wearer from the elements–any more than the money spent on telecommunications is spent to convey vital information. Most of the value in apparel, perhaps 80%, is spent on solving psychological needs. And therein lies the opportunity. As the value is beyond functional, substitution of psychological jobs by new products is a matter of engineering better solutions. Consider the behavior of US teens: anecdotally, their spending on apparel is fading as the solution to feeling good about themselves increasingly relies on a device and service. Already, in this context, apparel retail is in crisis while buying shifts to devices. 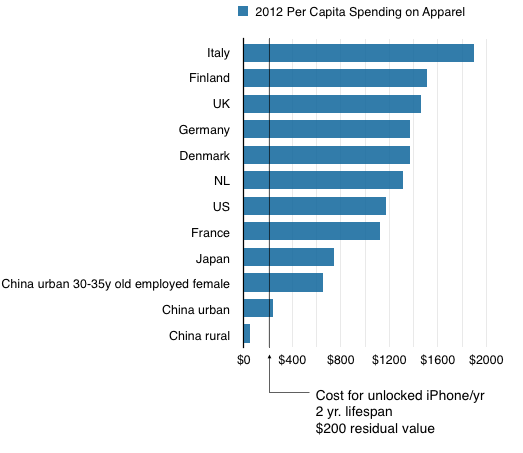 In many markets individuals spend more on apparel than on personal technology. And as personal technology increasingly competes for the same jobs to be done, that spending will transfer to the entrants. To know who’s already planning for this you can follow the trade news on the hiring of talent.